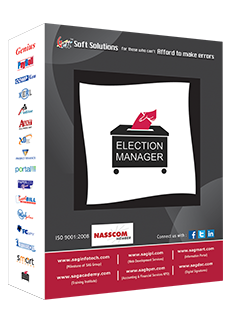 This accomplished and fully efficient software “ELECTION MANAGER” features the most comprehensive set of Political Campaign Management Software Tools on the World Wide Web. Use our campaign manager software to help you create your campaign, win your campaign, and then manage your campaign! We offer better political campaign tools than any other competitor for a fraction of their price. We also provide all the tools to show how a political campaign can be established. Election manager is the software that will be your manager during the toughest times of election. It will manage the allotted work of your team members as well as it will help you in maintaining the feedback of voters. Administrator can maintain a complete database of voters including address, contact details, email-id, caste, sub caste, family members etc. Administrator can maintain and create the list of volunteers with their details. Administrator can assign the voters to volunteers according to area, email id, contact number etc. Administrator can maintain the complete record of mails and messages to voters. Administrator can transfer voters from one to another volunteer as per requirement. The most striking feature is that the administrator can see the campaign voter status with the help of a pie chart whether the voters have voted, not voted or dicey. By using this login panel, volunteers can maintain the number of voters in the form of excel sheet. Volunteers can also maintain the complete database of voters, including their address, email id, contact numbers, family members etc. Volunteer can create daily reports of voters and can maintain the meeting time, date, and day with voters. Our software gives volunteers to maintain the data of preference voting by voters in an election. Our software provides you the facility of bulk mail and SMS to voters. By using a tab or laptop near the election booth volunteer can mark the presence of voter according to their name. Volunteer can also add reference voters to the list of voters and their family details. Volunteer can maintain the voting status. Volunteers can maintain the Facebook page, twitter account and blogs for campaigning purpose with the help of our software. Contestant of election can assign its voter list to its team member for better results based on: - area, caste, religion. Contestant and team members can view the scenario of voters using a pie-chart whether the voters are in favor or not and dicey. Contestant and team members can send bulk SMS & mails to their respective voters using our software. Team members can add new voter to our software. On Election Day team members can easily locate the voters who came to booth to cast their vote & those who are absent. After that team members can send thanks and reminder messages to the respective voters. Complete details of voters provided by contestants are maintained in our software. All the feedback by voters can be maintained in our software. Remarks can be updated by team members day by day. Details of voters can be searched according to their contact numbers, address, name, and email –id by the team members. Family details of voters can also be maintained in our software.